Typically the ‘art season’ runs September to June, typically my art season as an independent self-representing artist runs the whole year, minus a couple weeks around Christmas holidays. This year I decided to book a month on the Hawaiian Island of Maui in August, and re-connect with nature and nurture my artists’ senses. It was a great adventure and one that will bleed into my work, with many posts about my trip to follow. August was a busy month for me while most of the Art World lay dormant. I finished some paintings, sold some art, showed my work in a Toronto gallery, and spoke with a popular Art magazine in New York City about my paintings of the last decade. Whitehot Magazine is a one of the leading online art magazines in the world, based in NYC, with contributing arts writers and art historians from all over the world, interviewing artists worldwide. In August, I had the great pleasure of speaking with Andrea Bell, a NYC art historian, critic and writer. Based in New York City, Andrea teaches Art History and Criticism at Parsons School of Design. Bell is a contributing writer for Whitehot Magazine and we spoke about; mountains, Canadianisms, pop culture, and the People of Canada Portrait Project. Excerpt from the article; “In her most recent work, Saturley has turned once again to the landscape, never really having left. Her new, visionary paintings collage different, unexpected elements of Canadiana rendered in her characteristic pop aesthetic. They oscillate between a graphic realism used for Canada’s famous mountain peaks or views of forest lakes, and the abstractness of the colorful, even psychedelic backgrounds. The sincerity of their celebration keeps them from tripping over into kitsch. Instead they are otherworldly and transportive, playful and humorous. Confronting the enormity of the landscape has become a crucial aspect in Canadian identity, and a thread that is woven throughout Saturley’s work. 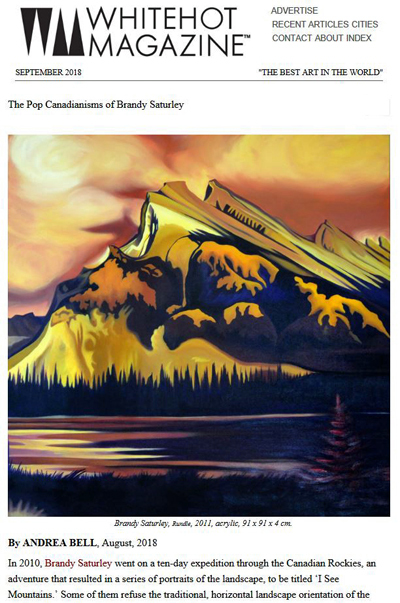 The “Canadianisms” series has already toured in both Edmonton and Calgary, and has garnered the artist notoriety as the voice of Canadian Pop Art.” read full article here.